Having your first child is a joy and a steep learning curve. For new parents, there are a great number of things to learn and discover as your child grows and as they say, children don’t come with an instructional manual. Care for your child’s dental needs can sometimes be put off until later, or lost in the shuffle. Fact is, tooth decay in young children is an all-too-common problem. It’s the second-most frequent cause of school absenteeism, and five times more common than asthma in children and teens. The good news is, tooth decay is preventable in nearly all cases. Dental care that begins at the appearance of their first tooth is an excellent way to prevent tooth decay from taking root. 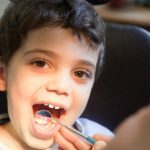 Your child’s first appointment with a dentist should happen in the first four years, even if problems are not apparent. make their first experience happy and successful as well. At your child’s first appointment, the dentist introduces everything slowly. He counts your child’s teeth to check for cavities and to see if he or she has the right number of teeth. The dentist does some light cleaning and applies some fluoride. We then take a picture of the child, and if there are no cavities, the photo gets added to the ‘No Cavity Club’ wall. Here are some more tips to help ensure your child’s teeth remain healthy and strong, for life. Your child shouldn’t sleep with a baby bottle containing milk. The milk contains sugar that can cause cavities early on resulting in “nursing bottle caries” – decay of the front baby teeth. If your child sleeps with a bottle or sippy-cup, fill it with water instead. As soon as the first tooth appears, start brushing your child’s teeth with fluoride toothpaste in the morning and before bedtime. Fluoride is a mineral that protects teeth. Put a small dab of toothpaste across a small soft brush. Wipe off excess toothpaste until the child can spit it out. Change your child’s toothbrush every one to three months or immediately after an illness. Let your child watch you brushing your teeth and assist with your child’s tooth brushing. To prevent spreading germs that cause tooth decay, do not put anything in your child’s mouth if it has been in your mouth. Visit your dentist by the age of four years. 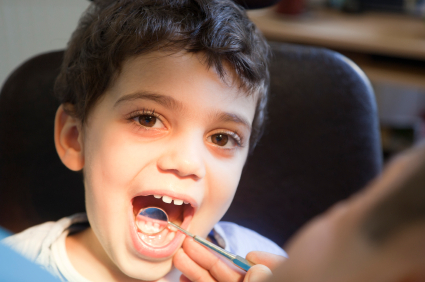 Take your child to the dentist for regular checkups to ensure there are no problems. or visit us at Bestgate Professional Center, 40 Finchgate Boulevard, Suite 121, Brampton, Ontario. Walk-ins and Emergencies are welcome. Providing dentistry for kids in Brampton and Peel Region including Bramalea, Caledon, Malton, Mississauga and Vaughan, Ontario.